Mutations in SLC4A1 that mislocalize its product, the chloride/bicarbonate exchanger AE1, away from its normal position on the basolateral membrane of the α-intercalated cell cause autosomal dominant distal renal tubular acidosis (dRTA). We studied a family exhibiting dominant inheritance and defined a mutation (AE1-M909T) that affects the C terminus of AE1, a region rich in potential targeting motifs that are incompletely characterized. Expression of AE1-M909T in Xenopus oocytes confirmed preservation of its anion exchange function. Wild-type GFP-tagged AE1 localized to the basolateral membrane of polarized MDCK cells, but AE1-M909T localized to both the apical and basolateral membranes. 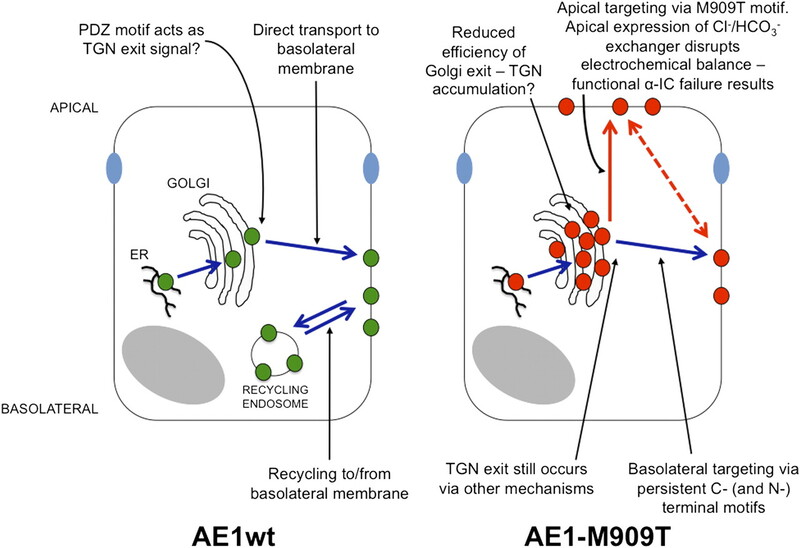 Wild-type AE1 trafficked directly to the basolateral membrane without apical passage, whereas AE1-M909T trafficked to both cell surfaces, implying the gain of an apical-targeting signal. We found that AE1-M909T acquired class 1 PDZ ligand activity that the wild type did not possess. In summary, the AE1-M909T mutation illustrates the role of abnormal targeting in dRTA and provides insight into C-terminal motifs that govern normal trafficking of AE1. To date, nine separate SLC4A1 mutations have been described in association with ddRTA.3,10–14 Where examined, the in vitro anion exchange function of these mutants was found to be at or near normal levels,3,6,12,15 suggesting that disease may instead occur through mistargeting of the mutant protein within the polarized α-IC.3 Expression of the C-terminal truncation mutant R901X in polarized Madin–Darby canine kidney (MDCK) cells confirmed this suggestion with mislocalization of the mutant kAE1 to the apical membrane, indicating the presence of basolateral targeting motifs within the C-terminal domain.16,17 Loss of polarized membrane expression has also been reported with the G609R mutant, whereas intracellular retention in polarized cells characterizes the R589H, S613F, and C479W mutants.12,14,17 Additional investigation confirmed the tyrosine residue at position 904 within the C terminus as a basolateral determinant; the phosphorylation states of both this determinant and an N-terminal tyrosine seem important in governing trafficking to and from the membrane.16–18 In addition, the extreme C terminus of AE1 conforms to the X-Φ-X-Φ amino acid sequence of a class II PDZ (postsynaptic density protein, Drosophila disc large tumor suppressor, Zonula occludens-1 protein) ligand; such interactions may also play a role in membrane targeting or retention.17 However, nothing else is known of targeting motifs or trafficking partners for AE1. We report here the identification of a novel C-terminal mutation in a family with ddRTA and examination of its anion exchange function and trafficking properties compared with wild-type kAE1 (kAE1wt). This mutant kAE1 retains good anion exchange function but possesses a novel apical targeting motif, unusually without concomitant loss of basolateral determinants. The mutation introduces a C-terminal class I PDZ ligand motif, which we have confirmed in vitro. For the first time, we also show direct postsynthetic traffic of kAE1wt to the basolateral membrane. A five-generation pedigree with renal stone disease and/or overt dRTA was investigated for the presence of an SLC4A1 mutation (Figure 1A). The index case was a boy of 4 years at the time of diagnosis after investigation for recurrent vomiting, muscle weakness, and back pain. Serum biochemistry showed a metabolic acidosis, and urine biochemistry revealed hypocitraturia (Supplemental Table 1). Hypocitraturia was also shown in his father, who had a history of severe recurrent nephrolithiasis and mild CKD. Mutation identification. (A) Pedigree with index case arrowed. Filled symbols, family members affected by renal stone disease or diagnosed with dRTA; slashes, deceased; central filled symbol, obligate carrier. (B) Genomic DNA sequencing in the index case shows heterozygous substitution of T for C at nucleotide 2,840, resulting in the replacement of methionine by threonine at codon 909 (M909T). (C) This finding leads to loss of the restriction site for NlaIII amplification and NlaIII digestion of exon 20 from five family members, and a normal control shows cosegregation of the mutation with disease. (D) Multiple species sequence alignment of the C terminus of AE1 shows that Met909 is highly conserved. (E) The M909T alteration results in loss of a class II PDZ ligand and generates a potential class I PDZ ligand motif. Sequencing SLC4A1 identified a novel mutation: c.2840T>C in exon 20 (Figure 1B). This finding results in the substitution of methionine by threonine at position 909 within the C-terminal tail. The altered sequence leads to loss of an NlaIII restriction site; restriction digestion confirmed that the mutation segregated with disease through the family (Figure 1C). The remaining coding exons were normal. The site and nature of the M909T mutation in the C terminus of kAE1, a region known to contain targeting information, were suggestive of a functional consequence. Ala-Met909-Pro-Val constitutes a possible but to date, poorly characterized C-terminal PDZ binding motif, with methionine highly conserved across species (Figure 1D). The potential for the C terminus of AE1 to act as a class II PDZ ligand has previously only been shown in principle through a yeast two-hybrid interaction with PICK-1 that was not further characterized.19 The M909T substitution could lead either to loss of a class II motif or its conversion to a class I motif (Figure 1E). X. laevis oocytes, which lack endogenous AE1 and have been widely used to assess anion exchange function of transfected AE1,3,12,20 were microinjected with in vitro-transcribed cRNA encoding kAE1wt or kAE1-M909T. Biotinylation of surface proteins confirmed expression of each. No intracellular trafficking defect was evident: kAE1wt and mutant kAE1 reached the oocyte surface in approximately equal quantities (Figure 2A and Supplemental Figure 1). The minor mobility shift of the mutant may reflect less extensive glycosylation. Expression of kAE1 in Xenopus oocytes. (A) Western blot analysis of microinjected Xenopus oocytes confirms similar levels of surface expression of kAE1wt and kAE1-M909T (approximately 95 kDa biotinylated surface fraction) using the anti-AE1 monoclonal antibody Bric-170. Actin control confirms biotinylation of surface fraction only. (B) 36Cl uptake by oocytes injected with wild-type (WT) or mutant (M909T) kAE1 cRNA in the presence or absence of DIDS. Control oocytes were injected with water. Values are means ± SEM of influx pooled from five separate experiments with 9–33 oocytes/group. NS = not significant. kAE1-M909T activity, thus, remains substantial; the additional presence of kAE1wt in the in vivo kidney predicts near-normal levels of α-IC anion transport activity, which was previously shown when kAE1wt and mutant kAE1 have been coexpressed in Xenopus oocytes.3,21 Thus, a defect in anion exchange function is unlikely to account for ddRTA in this pedigree. Transient and stable transfection of MDCK cells grown to polarity confirmed normal basolateral localization of both GFP-kAE1wt and GFP-kAE1-M909T but showed additional abnormal apical distribution of GFP-kAE1-M909T with preservation of tight junctions and normal polarity (Figure 3 and Supplemental Figure 3). Unlike kAE1wt, there was, in addition, considerable intracellular accumulation of the mutant protein. Membrane localization at both surface domains was again confirmed by Bric-6 staining (Figure 3). Expression of kAE1-M909T with an N-terminal hemagglutinin tag gave similar results (Supplemental Figure 4). Apical mistargeting of mutant GFP-tagged kAE1-M909T in polarized MDCK cells. N-terminal GFP-tagged kAE1wt or kAE1-M909T (green) expressed in stably transfected MDCK-II cells grown to polarity on Transwells shows normal basolateral localization of kAE1wt and both apical and basolateral localization of kAE1-M909T confirmed by immunostaining in these nonpermeabalized cells with Bric-6 (antibody directed against an exofacial loop). Scale bars, 10 µm. Expression of kAE1wt increases paracellular permeability of filter-grown MDCK cells. Cells grown to polarity on Transwells were biotinylated at either the apical (AP) or basolateral (BL) surface and then lysed. Western blotting of the initial cell lysate (total lysate lanes are the loading control) and the isolated biotinylated fraction (surface fraction) shows that in untransfected cells, only trace amounts of the basolateral proteins E-Cadherin and Na+/K+-ATPase were detected at the apical surface, whereas proportions at both surfaces seemed equal in kAE1-expressing cells. A significant proportion of kAE1wt was also apparently localized to the apical surface. These biotinylation data are at odds with immunofluorescence images for all three markers in the same kAE1wt-expressing MDCK cells (Figures 3 and 6 show kAE1wt), which localize all three proteins to the basolateral membrane only, indicating that kAE1wt increases paracellular permeability to biotin. Representative of two separate experiments. To examine the postsynthetic route to the cell surface, a domain-specific antibody-labeling assay was, therefore, designed using Bric-6. Apical or basolateral appearance of gp135 or the β1-subunit of the Na+/K+-ATPase, respectively, was consistent with known trafficking patterns, and it confirmed the integrity of the assay (Supplemental Figure 5).33,34 Apical incubation with Bric-6 in MDCK cells expressing GFP-kAE1wt failed to label the protein, the pattern of expression being normal (basolateral) when the GFP tag was examined (Figure 5A). In contrast, basolateral incubation with Bric-6 resulted in protein labeling at the membrane plus additional intracellular accumulation of Bric-6/GFP-kAE1wt complexes (Figure 5A). The proportion of cells with intracellular accumulation increased with longer incubation, whereas the total number of expressing cells seemed to decline, suggesting that degradation of the intracellular antibody–AE1 complex may occur. Taken together, these results are consistent, first, with the direct basolateral trafficking of GFP-kAE1wt without any transient apical passage and second, with GFP-kAE1wt internalization from the basolateral membrane. Antibody uptake assay showing that kAE1wt traffics directly to the basolateral membrane. After induction of GFP-kAE1 expression, Bric-6 antibody was added to either the apical or basolateral compartment immediately (16 h) or at a later time (3 or 1 h) before fixing. (A) In cells expressing GFP-kAE1wt, no staining was evident with apical application of antibody (top panel), but basolateral application led to labeling of GFP-kAE1wt and internalization of the antibody–AE1 complex, with intracellular accumulation most evident in the 16-h assay (left column). (B) In cells expressing GFP-kAE1-M909T, application of Bric-6 to either compartment labeled both apical and basolateral surface kAE1-M909T, with increased staining at the opposing surface evident with longer incubation times (16 versus 3 h). Representative of (A) seven or (B) two separate experiments. Scale bars, 20 µm in A; 10 µm in B. In GFP-kAE1-M909T–expressing cells, the same antibody-labeling assay confirmed trafficking of kAE1-M909T to both apical and basolateral domains (Figure 5B). When Bric-6 was applied to the apical surface, there was also staining at the basolateral membrane and vice versa; this finding was more apparent for the longer incubations, indicating that kAE1-M909T internalizes from both apical and basolateral membranes. From the recycling compartment, it can again reach either domain. 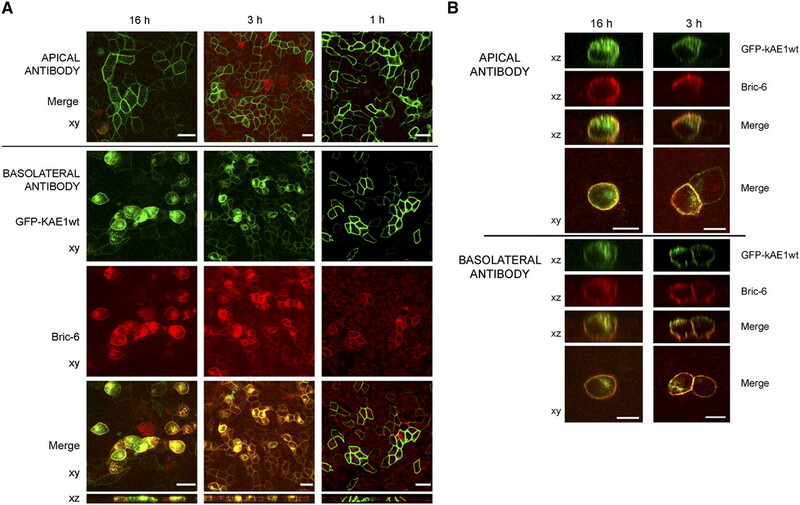 Interestingly, the striking intracellular accumulation of AE1–antibody complex seen with the AE1wt cells was less apparent with the mutant protein; intracellular GFP-AE1-M909T was still present but only clearly counterstained with Bric-6 in the 16-h basolateral images and not when Bric-6 was applied to the apical surface. This finding implies that the intracellular GFP-AE1-M909T accumulation observed previously (Figure 3 and Supplemental Figures 2–4) could represent protein that reaches the membrane much more slowly (or never at all) and that the M909T substitution could alter the normal recycling pathway of kAE1. To further investigate motifs governing kAE1 traffic to the cell membrane, two other C-terminal mutants (kAE1-908X and kAE1-M909A) that mimic loss of PDZ binding capacity were created and expressed. Normal monolayer integrity was confirmed by staining for ZO-1 (Supplemental Figure 6). In both cases, GFP fluorescence seemed intracellular, and Bric-6 surface staining was negative. After permeabilization, the fluorescence colocalized with Bric-170 (directed against the cytoplasmic N terminus of AE1), confirming successful expression but intracellular retention of both mutants (Figure 6). GFP-kAE1-M909A and -908stop mutants are intracellularly retarded. Both Bric-6 (columns 1–3, nonpermeabilized) and Bric-170 (columns 4–6, permeabilized) staining failed to show membrane localization of either mutant in mixed stable lines in contrast to normal localization of kAE1wt (top row). Scale bars, 20 µm. The antibody uptake assay was repeated for both these mutants. In neither case was there any positive staining with Bric-6, indicating that the mutant proteins never reached the cell surface (i.e., intracellular accumulation was a primary postsynthetic event did not result from a failure of membrane retention). These findings indicate that a C-terminal domain containing residues corresponding to a PDZ ligand is essential for biosynthetic traffic of kAE1 to the cell surface. To assess whether kAE1-M909T could act as a class I PDZ ligand, we screened glutathione S-transferase (GST) fusion constructs of the C termini of AE1wt and mutant AE1 against a proteomic array of 96 PDZ proteins/peptides,35 comprising known or potential class I domains. Clear binding was found between kAE1C-M909T but not kAE1C-wt and PDZK1, membrane-associated guanylate kinase, WW, and PDZ domain-containing protein (MAGI)-1, and MAGI-3 (Figure 7A). In contrast, none of the 96 class I domains showed wild-type but not mutant binding. PDZK1 was selected for additional analysis as a candidate class I domain-containing protein. ELISA clearly showed binding of mutant but not kAE1wt to purified PDZK1, confirming acquisition of a class I motif by the mutant. Binding was optimal at 2 μg/ml concentrations of PDZK1 at 10 minutes incubation (Figure 7B) and also significant at 1 and 5 μg/ml (data not shown). The C-terminal tail of kAE1-M909T is a class I PDZ ligand. (A) A proteomic array containing 96 putative class I PDZ domains (38) showed binding of GST-kAE1-M909T (lower panel) but not its wild-type equivalent (upper panel) to bins A2, A10, and G1 (MAGI-3, MAGI-1, and PDZK1). (B) The interaction with purified PDZK1 was confirmed by ELISA. Data are means and SEM of three experiments. In characterizing M909T, a novel disease-causing mutation in SLC4A1, we have added new information concerning not only the functional activity and cellular phenotype of the mutant protein but also the normal behavior of kAE1. The M909T mutation had clear potential significance given its location within the C-terminal domain of kAE1 because of the known contribution of the C terminus to targeting and the important role of mistargeting in other ddRTA-causing AE1 mutations. In addition, anion transport by kAE1-M909T expressed in oocytes was reasonably preserved at approximately two-thirds of wild type, making loss of transport function unlikely to be the cause of α-IC failure in vivo. The mistargeting hypothesis to explain ddRTA was originally proposed after functional studies of the first mutants showed near-normal AE1 anion exchange activity.3 Subsequent expression of various ddRTA-associated mutant kAE1 in polarized cells has characterized subsets of mutations resulting in either intracellular retention (R589H and S613F) or mistargeting to apical and basolateral surfaces (R901X and G609R in transiently transfected cells) or the apical surface alone (R901X in stably transfected cells).12,16,17 Overexpression in transiently transfected cells may lead to abnormal nonpolarized expression (LLC-PK1 cells are discussed in the work by Toye et al.17); ideally, stably transfected cells combined with determination of cell surface residency through Bric-6 staining should be employed for assessment of all mutants. Using this system, expression of GFP-AE1wt or GFP-M909T in polarized MDCK cells indicated a clearly aberrant targeting phenotype for the mutant, which was confirmed with a hemagglutinin-tagged construct. Because we have here shown that the wild-type construct moves directly to the basolateral compartment, the apical membrane appearance of the mutant indicated likely gain of a new targeting motif; basolateral signals, which are known not to reside solely at the far C terminus, would be preserved. Against the theory that cell polarity was more widely disrupted by introducing the mutant, normal tight junctions and apical gp135 were observed. It remains true that no groups have yet been able to identify the previously hypothesized class II ligand activity for AE1.19 We nevertheless considered whether simple loss of a class II motif, without gain of class I, could explain our observations. This test should have resulted in the same appearances as reported for kAE1-V911X (the lack of C-terminal valine likely leading to loss of class II ligand activity17), which resulted in basolateral residency with increased levels of intracellular protein but no apical appearance, suggesting that a class II ligand might be important in either maximizing efficiency of basolateral biosynthetic membrane traffic or mediating basolateral retention in situ. Instead, the results from the PDZ array and ELISA with PDZK1 clearly show that kAE1-M909T is capable of acting as a class I PDZ ligand. The alternative explanation that M909T disrupts the C terminus to such an extent that previously suppressed apical determinants within kAE1 (e.g., N-glycans36) can exert a targeting effect is less likely for several reasons. First, there was no apical expression of kAE1-V911stop; second, kAE1-M909T shows persistent basolateral presence, implying preservation of its other determinants, and third, the overall structural effect of a single residue substitution so close to the C terminus is unlikely to be major. It is a shame that PDZK1, although an excellent candidate to show the potential for interaction and well characterized as an apical scaffolding protein for a number of proteins within renal tubular cells, is only present in the brush border of the proximal tubular epithelium and not in α-ICs.37–39 MAGI-1 is present within glomerular podocytes,40 and an isoform colocalizes with Kir4.1 in collecting duct principle cells41; expression of MAGI-1 in α-ICs has not been reported, and renal expression of MAGI-3 is as yet undefined. We have not proceeded to try to identify the actual PDZ protein involved, because this protein is a unique pathologic mutant that would not be likely to provide generalizable information and α-ICs do not readily submit to in vitro growth. The previously reported C-terminal truncation mutants that were partially or completely retained in nonpolarized cells implied the presence of sequence information essential for kAE1 traffic to the surface.45 In our system, kAE1wt and M909T mutant kAE1 each reached the cell surface in both nonpolarized HEK and MDCK-II cells, suggesting preservation of motifs involved in quality control, although there was increased intracellular retention of the mutant implying reduced efficiency of intracellular trafficking. PDZ proteins also mediate transit from/through the endoplasmic reticulum (ER) and Golgi. For example, proTGF-α contains a type I PDZ ligand domain (-ETVV) at its C terminus, which binds the PDZ protein proTGF-α cytoplasmic domain-interacting protein 18 (TACIP18) or syntenin, an interaction necessary for exit from the ER. TACIP18/syntenin can, in fact, bind both classes I and II PDZ ligands.46 Pro-TGF mutants lacking a C-terminal valine were retained in the ER, such as with AE1-V911stop. Similar mechanisms and interactions may, therefore, also control kAE1, because presence of an intact PDZ ligand domain seems essential for normal traffic to the cell surface. Promiscuity of the kAE1 cognate PDZ protein, the identity of which remains unknown, may, as in TACIP18, allow binding of both types I and II ligands; hence, there is the persistent ability of kAE1-M909T to exit the synthetic compartment, albeit with reduced efficiency. Whether kAE1wt contains a specific ER retention signal—suppressed by the PDZ motif or its binding partners—is unclear. However, the AE1 C terminus does not contain any of the classic lysine- or arginine-based motifs previously identified as retention signals.47 Also against this idea is the ability of the truncation mutant kAE1-R901X to reach the cell surface, although it may have lost both PDZ binding domain and retention signal, be significantly misfolded at the C terminus to avoid PDZ interaction, or attract different trafficking intermediates. Hetero-oligomerization of kAE1 explains how each type of mutation results in α-IC failure in vivo. Intracellularly retained mutants will also retain kAE1wt, thus leading to insufficiency of basolateral membrane anion exchange capability.48 In contrast, where abnormal apical expression occurs, functional hetero-oligomers will appear apically, potentially together with reduced basolateral expression of kAE1wt; the former would result in neutralization of secreted H+ and thus, failure of acid secretion by the distal nephron, whereas the latter would also reduce bicarbonate reabsorption, both leading to α-IC failure. Although coexpression of differently tagged kAE1wt and mutant kAE1 in polarized cells would permit assessment of these possibilities, our attempts and the attempts of others17 at coexpression in MDCK cells were unsuccessful in achieving significant expression levels using transient and stable transfection (of one or both constructs). Most recently, the work by Chu et al.14 has reported some success with coexpression of the kAE1 C479W and G701D mutants. We have here also confirmed the previous, and somewhat unexpected, finding that the presence of kAE1wt increases the paracellular permeability of epithelial monolayers in culture. The validity of this finding is increased by the similar changes in both subtypes of MDCK cells, which have different compositions of the tight junction complex.49 Expression levels were not significantly high enough to ascertain whether this effect was also true in vitro for kAE1-M909T. Whether kAE1 exerts the same effect on the tubular epithelium in vivo is also unknown. The intracellular accumulation of antibody–kAE1wt complex in our antibody-labeling assay implies that bound antibody resulted in defective recycling, an unusual phenomenon but one previously reported for antibodies against the phosphomannosyl receptor in cultured fibroblasts, the transferrin receptor in chicken erythroblasts, and gp280 in rat yolk sac epithelial cells.50–52 Unfortunately, no clear pattern emerges from these reports of a mechanism by which Bric-6 could cause intracellular accumulation of GFP-kAE1wt. Regulation of cell surface kAE1wt has recently been described to depend on the phosphorylation state of tyrosine residues at positions 359 and 904 within the N and C termini, respectively18; whether antibody binding affects phosphorylation state is also unknown. 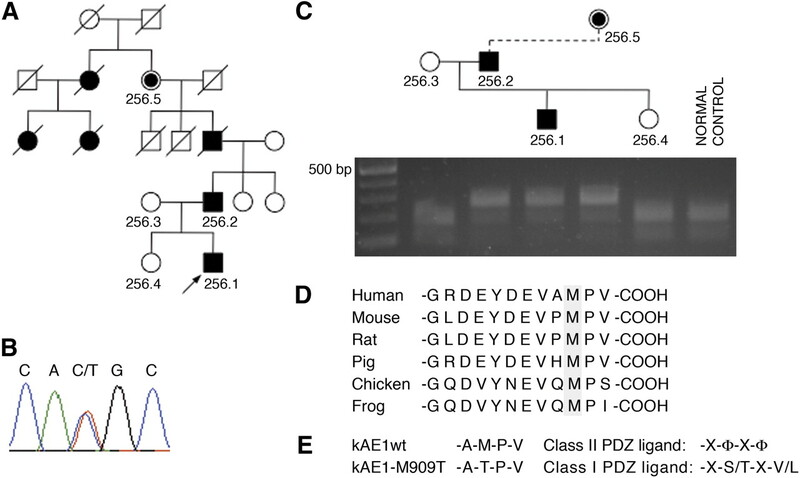 The diagnosis of ddRTA in affected families and the molecular and functional classification of novel AE1 mutants continue to provide insights into both disease mechanisms and normal trafficking behavior of kAE1. Figure 8 illustrates our proposed model for kAE1 trafficking based on these observations. Future work should focus on identification and investigation of interacting proteins—particularly those proteins containing PDZ domains—that mediate traffic of AE1. Suggested model for trafficking of kAE1wt and -M909T. For clarity, the recycling endosome has been omitted from the kAE1-M909T cell. The dotted red line indicates a possible transcytotic route. Under the terms of Cambridge Local Research Ethics Committee approval 99/078, written informed consent was received from participants/parents before inclusion in the study. Genomic DNA was amplified using intronic primers to examine all coding exons and intron–exon boundaries of SLC4A1 and sequenced by Geneservice Medical Solutions PLC. Sequences were analyzed using Sequencher analysis software (Gene Codes Corporation). 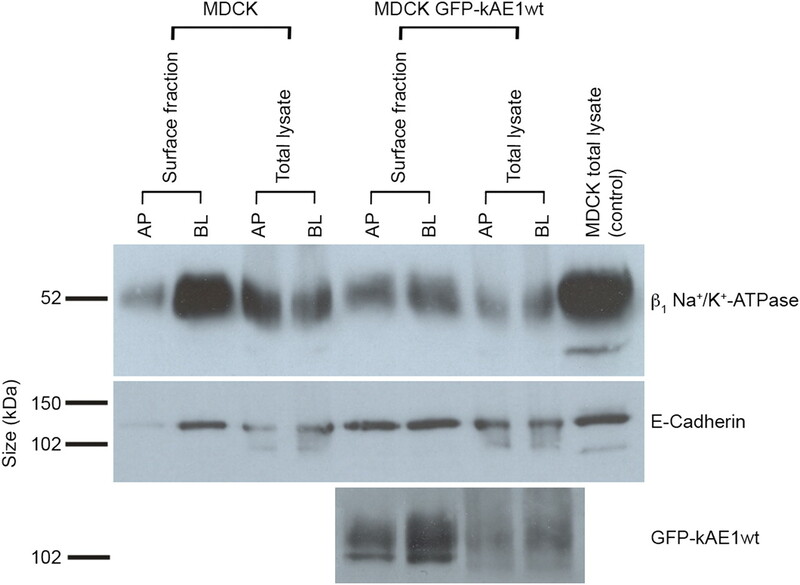 Anti-AE1 antibodies used were Bric-170, which recognizes a cytoplasmic N-terminal epitope from residues 368–382,55 and Bric-6, which recognizes an extracellular epitope of AE1 situated within the fourth exofacial loop24 (both mouse monoclonal antibodies from IBGRL). Additional antibodies used (all mouse monoclonal antibodies unless indicated otherwise) were directed against the β1-subunit Na+/K+-ATPase (Sigma-Aldrich), hemagglutinin (rat; Covance), ZO-1 (rat; Santa Cruz), gp135 (gift of F. Buss, Cambridge, United Kingdom), E-cadherin (Transduction Labs), and β-actin (Abcam). Species-specific horseradish peroxidase-conjugated secondary antibodies (Dako) and AlexaFluor-conjugated antibodies (488, 555, and 568; Invitrogen) were used in Western blotting and immunofluorescence studies, respectively. kAE1wt was excised from laboratory stocks of pHM6-kAE1wt12,16 and cloned into the vector pEGFP-C2 to create an N-terminal GFP-tagged kAE1 construct for transient transfection of HEK and MDCK cells. For generation of stable cell lines, the GFP-kAE1 construct was subcloned into the ΔpMEP4 vector56 (gift of J. P. Luzio, Cambridge, United Kingdom). Site-directed mutagenesis to create M909T was again performed using the QuikChange kit and confirmed by direct sequencing. HEK293 and MDCK-II cells were grown in DMEM supplemented with 10% FBS and 2 mM l-glutamine and maintained at 37°C in 5% CO2-balanced air. HEK and MDCK transfection used FuGENE 6 Transfection Reagent (Roche) or the Cell Line Nucleofection Kit L (Amaxa), respectively, as per manufacturer’s protocols. Selection of stable transfectants over a 2-week period was followed by induction using 2 μM CdCl2 and 100 μM ZnCl2 followed 16 h later by FACS sorting for GFP fluorescence (MoFlo Cell Sorter; Beckman Coulter). Nonpolarized cells were seeded at low density onto coverslips; cell polarization was achieved by seeding onto semipermeable polycarbonate filters (Transwells; Corning Life Sciences). In the case of coverslip-grown cells, those cells transfected with ΔpMEP4 were induced on day 3 using 2 μM cadmium chloride and 100 μM zinc chloride, and cells were fixed/stained 16 h later. Cells grown to polarity on Transwells were induced on day 4 and fixed/stained 16 h later (using the same concentrations of cadmium and zinc for the ΔpMEP4-inducible promoter and 5 mM sodium butyrate to enhance pHM6 vector expression). Immunostaining (for all antibodies except Bric-6) was performed as described previously.23 In the case of Bric-6, the antibody in 1% BSA was applied directly to washed intact unpolarized cells on coverslips or both compartments of polarized cells on Transwells (previously incubated with PBS for 20 min at 4°C) for 1 h at room temperature. After washing, cells were fixed by incubation in ice-cold methanol at −20°C for 5 min, washed again, and blocked with 3% BSA for 15 min before addition of fluorescently labeled secondary antibody for 45 min at room temperature. For optimum results, we used the AlexaFluor 568 Signal-Amplification Kit for mouse primary antibodies (Invitrogen). MDCK-II cells were grown to polarity on Snapwell polycarbonate filters (Corning), and their electrical properties were assessed by the voltage clamp technique.57 Comparisons were made between untransfected and ΔpMEP4-kAE1wt transfected cell monolayers both with and without the addition of cadmium and zinc 16 h before. Bric-6 labeling of surface kAE1 at either the apical or basolateral Transwell compartment was based on the transcytosis assay in the work by Ihrke et al.58 Antibodies directed against external epitopes on gp135 or the β1-subunit of the Na+/K+-ATPase were used as controls. Using the ΔpMEP4 stably transfected cells grown to polarity on Transwells, promoter expression was induced as above on day 4, with antibody added to either apical or basolateral compartment at the same point (16 h prefixation) or for shorter time points (3 or 1 h prefixation). Cells were fixed, labeled with fluorescent secondary antibody, and imaged 16 h after induction of expression. GST-tagged AE1C-WT (containing the final 36 residues of AE1) or mutant fusion protein (GST_AE1C-M909T) were separately expressed in Escherichia coli BL21 cells and purified using glutathione sepharose beads (Amersham Biosciences). GST_AE1C-WT, GST_AE1C-M909T, or an equivalent amount of GST was diluted in 0.05 M Na2CO3/NaHCO3 buffer (pH 9.6) to 20 μM and immobilized onto 96-well plates at 37°C for 1 h. After nonspecific site blockade, PDZK1 protein (Abnova) in the range of 1–5 μg/ml was applied and incubated at 37°C for 1 h. Mouse monoclonal α-PDZK1 antibody (Abcam) and horseradish peroxidase-conjugated α-mouse IgG antibody (DAKO) were used to detect and quantify bound protein according to standard methods. Statistical analyses were performed using a t test. We thank Dr. Folma Buss (Cambridge, United Kingdom), Prof. Paul Luzio (Cambridge, United Kingdom), and Prof. Randy Hall (Atlanta, GA) for reagents and Dr. Gudrun Ihrke (Bethesda, MD) for advice and expertise. This work was funded by a Kidney Research United Kingdom Training Fellowship (to A.C.F. ), Wellcome Trust Senior Fellowship 088489 (to F.E.K.F. ), and Award 079895 (to Cambridge Institute for Medical Research), and the Cambridge National Institute for Health Research Biomedical Research Centre. This article contains supplemental material online at http://jasn.asnjournals.org/lookup/suppl/doi:10.1681/ASN.2012020112/-/DCSupplemental.